AYER, Mass.--(BUSINESS WIRE)--Cambrooke Therapeutics Inc., a leader in therapeutic nutrition for inborn errors of metabolism and ketogenic diet therapy, announces the introduction of GlytactinTM BUILD, a unique medical food formula for the dietary management of Phenylketonuria (PKU). This latest addition to the glytactin family of PKU products was designed to enhance availability of the specialized glytactin protein for those on a low phenylalanine diet seeking more protein and fewer calories than traditional PKU Medical Foods. At only 54 calories per 10 grams of Glytactin protein, GlytactinTM BUILD is the lowest calorie GMP-based formula available. With a complete profile of vitamins and minerals as well as probiotics to support digestive health, GlytactinTM BUILD is a versatile powder with a neutral flavor to be taken alone or as a way to build up the protein level of other PKU formulas or low protein food items. GlytactinTM BUILD has a pH equivalent to water that helps ease the GI distress associated with consuming traditional PKU formulas made from synthetically derived amino acids. 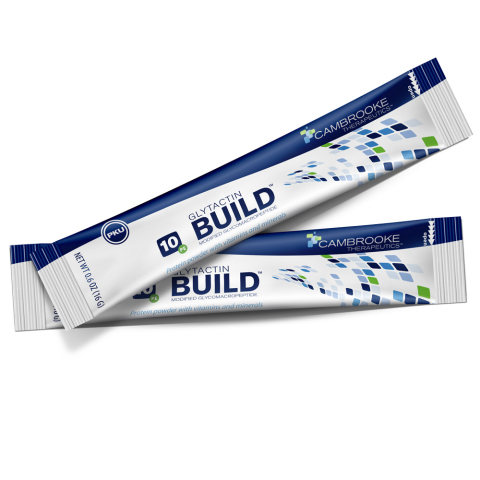 Each convenient stick pack contains 10 grams of protein equivalent glytactin and is sold with 30 sticks per box. “I started adding GlytactinTM BUILD to my current formula to boost the protein level and smooth out the amino acid burn,” said Melinda S. “When I do, my stomach feels better, so I feel better”. Cambrooke introduce Glytactin BUILD with the pH balance of water and the lowest calorie GMP-based formula available.